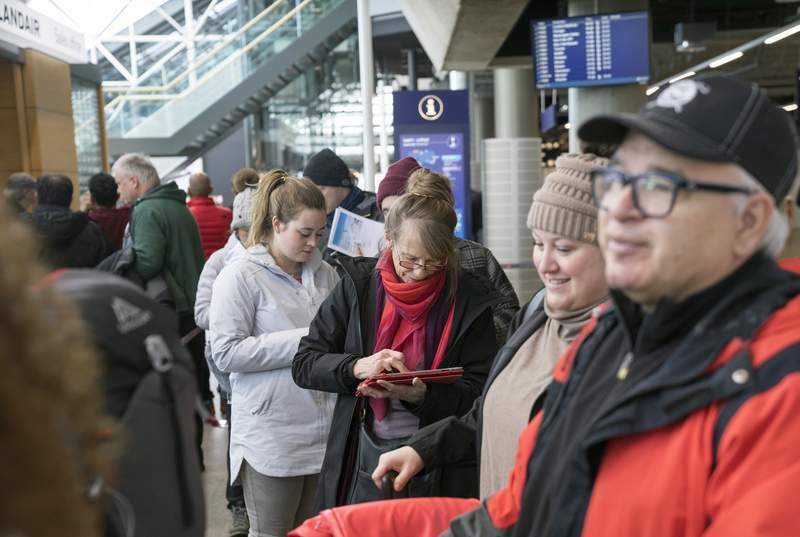 Associated Press Stranded passengers set to travel with Icelandic airline WOW, which grounded all flights, wait in line at Iceland's international airport in Keflavik. REYKJAVIK, Iceland – Icelandic budget airline WOW Air collapsed under its financial problems Thursday, leading it to ground planes and leave passengers stranded across two continents. Tourism is Iceland's largest industry, and WOW's disappearance is set to have an effect on this summer's high season. In Europe, Reykjavik-bound planes from seven cities – Amsterdam, Dublin, Paris, Brussels, Berlin, Frankfurt and Copenhagen – did not take off Thursday. One airplane from WOW was grounded as collateral by Iceland's airport operator, which reportedly has a $16 million claim for unpaid landing fees against the airline.